When Vesta Lee Gordon ’64 read about the new student apartment village, her response was to help make the village become a reality. 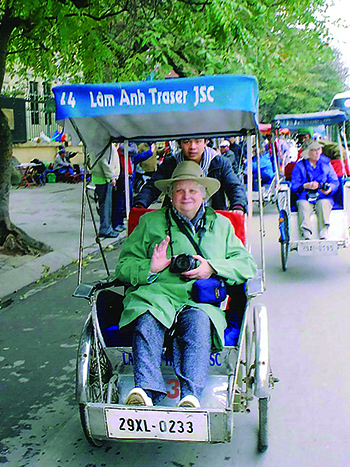 Noting that having all students living on campus without the separation of Williamson Road, she immediately made a significant philanthropic commitment to a house, one she hopes will be called the “Class of 1964 House.” In making the gift, she challenges her classmates to join her in funding a house to honor, in her words, “a great class.” In her self-deprecating way, she noted she is not known for thinking or speaking much, but she hopes to inspire others to support a project to honor her class and to give students the opportunity to partake fully in campus life. Gordon enjoys listening to music, reading, gardening, and travel, and she cares about the future of Hollins and about providing students a wonderful new place to live in the apartment village. In an exciting and historic moment for Hollins, the Board of Trustees has approved breaking ground on construction of Phase I of the new student apartment village. To prepare for the new village, the homes along Faculty Row were removed this past summer and fall in order to undertake site work and infrastructure improvements. This initial groundwork allows Hollins to move forward with Phase I construction in the next few weeks. This is our first new residential housing in 50 years, and the four houses that are part of Phase I will be available for residential students starting in fall 2019. The construction reflects eight years of planning, design, and a focused fundraising effort over the past year and a half to launch this initiative. It will offer a modern, attractive, centrally located residential space fostering greater vibrancy and connectivity on our campus. In addition, the village will build new kinships and engagement on campus. Our powerful sense of community is one of the many ways in which Hollins is such an amazing place to live and learn, and the new village will enhance this strength. The student apartments on Williamson Road will close in late July following the conclusion of our graduate programs’ summer term. In the meantime, discussions are underway with Roanoke County, local landowners, and consultants about potential future development along the Williamson Road corridor leading to campus. Opportunities may include new retail establishments, restaurants, rental apartments, townhouses, and other services that will benefit our students and employees as well as those who live and work in the North Roanoke County area. We are grateful to the many donors who embraced the concept and the goals of the new village and enthusiastically supported the first phase of this important project. With the generous help of like-minded alumnae/i and friends of Hollins, we look forward to bringing Phase II of the student apartment village to fruition. For information about the apartment village and how you can help build the remaining six houses, please contact Suzy Mink ’74 at minks@hollins.edu. This article has been updated from the print version to reflect the current status of the student apartment village. Last November, nearly 100 leadership donors and members of the 1842 Society and Miss Matty’s Circle joined President Lawrence and trustees for a weekend in Nashville. Special thanks to Wyeth Outlan Burgess ’80, former trustee Caroline Arnold Davis ’60, Lucy Davis Haynes ’84, Angela Howard ’86, and trustee Tracy Roberts Frist M.A. ’03, M.F.A. ’14 for serving on the planning committee and orchestrating a wonderful weekend. Gifts from the 1842 Society represent a large portion of total gifts from alumnae through the Hollins Fund. The 2019 weekend will take place in New York City. 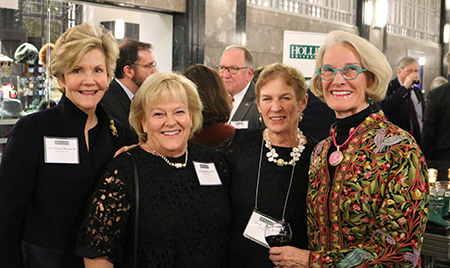 Shown left to right: Clark Hooper Baruch ’68, Anne Hipp Habeck ’68, Laura Burks Logan ’68, and Zelime Gillespie Matthews ’68. In December, an anonymous donor challenged Hollins alumnae, students, parents, and friends to boost participation in giving to the Hollins Fund. Supporters have the opportunity to acquire $100,000 for the Hollins Fund by increasing alumnae participation from 24 to 30 percent—or by reaching a total of 3,500 donors to the fund. An additional $100,000 can be earned if the number of donors giving $1,000 or more increases to 700. The $200,000 can be earned only if these challenges are met. Participation is what counts, so every gift made to the Hollins Fund by June 30, 2019, matters. The Hollins Fund has a direct impact on current students because it provides scholarship assistance toward an exceptional education. To make your gift, visit www.hollins.edu/giving.